LeoSat Enterprises, which is launching a constellation of up to 108 LEO communications satellites, has entered into a Memorandum of Understanding (MoU) to explore a potential service agreement with Globecomm Systems Inc., a leading global connectivity provider serving enterprise, oil & gas, maritime and government markets around the world. 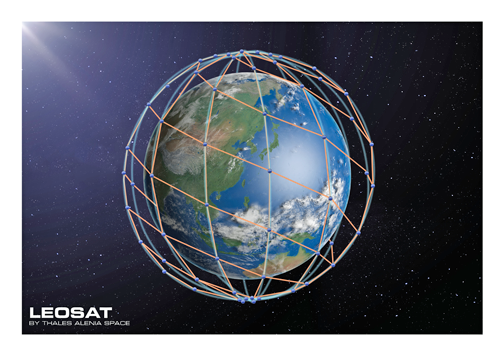 LeoSat’s Earth encompassing satellite constellation, in effect, an optical backbone in space, can provide instant infrastructure from anywhere to everywhere which is fast, secure and reliable, opening up a wide range of new opportunities for companies such as Globecomm looking to expand their existing network capabilities. The increasing demand to move large quantities of data quickly and securely around the world is fast outpacing the infrastructure in place to carry it. In 2015, global networks for the first time carried more than 1 Zeta Byte of traffic globally and this is forecast to grow exponentially. LeoSat’s unique new network delivering fiber-like symmetry at gigabit per second speeds has been designed to solve essential communications and connectivity issues and provide service without compromise to the harshest environments and the most remote areas for customers in sectors such as multi-national enterprise, oil & gas, maritime and government services. Chief Commercial Officer Bryan McGuirk of Globecomm said his company strongly believe in offering the smartest connectivity solutions to customers — with capabilities beyond satellite and fiber, LeoSat represents the next-generation of high-performance communications networks.